Brian Lantier began his lacrosse career at Huntington High School in New York and was named in his senior year to the 1960 first team All Scholastic Lacrosse Squad by the Metropolitan and Long Island Lacrosse Association. After a season at the University of Maryland playing at the attack position, he spent his next four years playing attack and midfield for the U.S Naval Academy. In his first year at Annapolis, Lantier broke an eleven year old Plebe scoring record. In four seasons he and his Navy teammates lost only one game and won three consecutive National Championships. 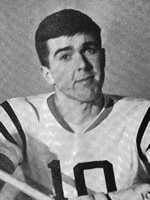 He received All American honors at both attack and midfield during his three varsity seasons and was named a first team All American midfielder in 1965. In that year he was captain of the first (and last) undefeated college lacrosse team in forty-two years to win both the National Collegiate and National Open Championships, and was named a South All Star starting midfielder in the ’65 North-South All Star Lacrosse Classic. At the Naval Academy Lantier also was a varsity soccer goalie and member of its 1963 National Champion Runner Up team. In 1965 he received the Stuart Oxnard Memorial Cup and entered the U.S. Naval Academy Athletic Hall of Fame. After completing his naval officer duty for nearly five years including Vietnam combat, he played for the Philadelphia Lacrosse Club and later for the Navy Old Goats at the Vail Shootout . Lantier is a member of the Bilderback-Moore Navy Lacrosse Hall of Fame, a former Board member of the U.S. Lacrosse Foundation, a former Board member of the Major League Lacrosse San Francisco Dragons team, and a current Board member of the U.S. Lacrosse Northern California Chapter. His sons Brian and Michael excelled as lacrosse players for Navy and Washington College; his two grandsons are currently Northern California Junior Lacrosse Association players. Barbara H. Longstreth played second home for Haverford Township High School in Pennsylvania from 1951-54. She was the captain and MVP in 1954. Barbara continued playing second home at Beaver College from 1955-58. She was captain of the 1957 and 1958 teams, and was honored as MVP in 1958. During her sophomore year, she was named to the U.S.A. national team. She played first home on the U.S. team from 1956-64, and then again in 1967. Barbara was inducted into both the Philadelphia Lacrosse Hall of Fame and the National Lacrosse Hall of Fame in 1998. Barbara has coached high school and club lacrosse for more than 17 years, and has more than 25 years umpiring experience. She pioneered women's lacrosse on the West Coast in the 1970s, and during that time, she founded Longstreth Sporting Goods. In 1977 Barbara started women’s club lacrosse in the Los Angeles area while coaching at Long Beach State. There was a club team at Stanford at the time. With her contacts in the USWLA, she was aware that the first touring team from Australia was coming to the US in the spring. So she organized a California team with players from both the north and south and they played the Australians at Long Beach before the Aussies traveled to the east coast. They beat the California team 19-4, but that day as the first game that Australia played on US soil. The United States Women’s Lacrosse Association (USWLA) also sent umpires for the contest, and held an umpiring clinic. Later that year, Barbara led a clinic for lacrosse coaches. Barbara moved to Northern California and spent the next 4 years coaching club lacrosse at Stanford---and generally organizing the sport in California. 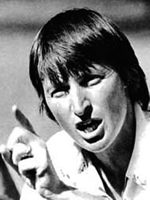 She connected with the USWLA as the California Women's Lacrosse Association, serving as president from 1977-80. There were club teams in Palo Alto, Berkeley, and San Jose, and they had hosted a team from Vancouver each year. Those women played box lacrosse in Canada, and they loved coming down to Nor Cal’s better climate and playing "field lacrosse". The Stanford club would travel south to play other college club teams, including UC Santa Barbara, Cal Poly Pomona, and Claremont colleges. Barbara would both coach and umpire for many of these games---and it was a most "fun-filled" time. Since it was sport on the club level, there was no pressure, and both she and her Stanford team had a wonderful time. They were highly successful, but it was also the joy of playing the sport that was most important. The culmination of her California experience was selecting and taking a California team to the USWLA National Tournament back East in 1980---the first team from California to go to this tournament. Barbara also received her national umpire rating at that tournament. She looks back on those days with fond memories! Barbara currently lives in Pennsylvania where she enjoys spending time with her family and friends. Jill Malko has been deeply involved with developing girls and women’s lacrosse since she moved back to Northern California in 1989. Originally born in Berkeley, Jill spent her formative lacrosse years in Philadelphia and later in college at Boston University. As a Terrier, she led her team as a defender to multiple post season performances and captained the squad as a senior. After graduation, Jill continued to play on post collegiate teams and coached at camps and clinics throughout New England. In 1986, she received her first rating and began umpiring as well. However, it was not until her return to the Bay Area that she began to immerse herself in development of the rapidly expanding sport of women’s lacrosse. Jill served as NorCal President of United States Women’s Lacrosse Association (formerly USWLA now US Lacrosse) from 1990 – 1995; on the USLWA board from 1990 – 96; and on the NorCal US Lacrosse chapter board for several years. Jill was instrumental in the development of the Northern California Women’s Lacrosse Association (NCWLA) and represented Nor Cal at US Lacrosse National Tournament for over 10 years. 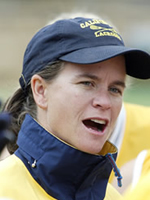 She founded and, as Head Coach, led the inaugural women’s collegiate team at St. Mary’s College (Moraga, CA) before taking the position of Head Coach at UC Berkeley. During her 11 year tenure she transitioned the program from college club to a successful Division 1 varsity sport, earning several Coach of the Year awards. Her teams participated in post season play in every season including league champions. Jill directed the Western States Tournament for five years and has served as an officer of the Western Women’s Lacrosse League (WWLL) as president or treasurer (currently serving) for over 17 years. She has been a coach as hundreds of camps and clinics all across the country and created the first girls traveling lacrosse club for high school age lacrosse players in California. Jill holds a district level officiating certificate and has umpired all levels from junior lacrosse to Division 1 games. She continues to umpire at high school and Division 1 levels. Linda Thayer has contributed to USLacrosse, and specifically California lacrosse, at many levels. After completing her playing career at the University of Massachusetts in 1982 as a member of the first women’s NCAA Division I championship team, she turned her efforts toward umpiring. She received her first rating in 1983 and moved through the ranks quickly, attaining her National rating in 1987. Since 1983, she has umpired all levels of girls lacrosse, from junior lacrosse to NCAA collegiate lacrosse, including many post-season conference tournaments. It is perhaps in the organization and training of umpires, however, that Linda has given the most to the sport. In 1997, she moved to California at a time when California lacrosse was seeing a virtual explosion in the growth of organized lacrosse for both boys and girls. Drawing from her experience in Board management for the Southeast Association, she organized the existing umpires into the Northern California Women’s Lacrosse Umpires Association (NCWLUA), and began the job of formerly developing umpires for all levels of girls lacrosse. NCWLUA grew from less than 20 umpires to more than 150 under her leadership. For several years, Linda was the only National umpire living West of the Rockies, and traveled throughout California and the Pacific Northwest, giving clinics and training and rating umpires. She served NCWLUA as its Chairperson and Treasurer from 1997 to 2008, and its high school assignor from 1998 to 2001. She has also acted as the Assignor for the Mountain Pacific Sports Federation since its formation in 2002. 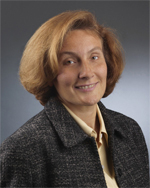 On the national level, Linda continues to be active in management of USLacrosse, having served as a Board Member from 1999-2001, and as a member of the Women’s Division Rules Committee since 1999. She also was the State Rules Interpreter for the California Interscholastic Federation from 2001 (when California joined NFHS) until she resigned in 2008. She also represented Region 7 on the Rules Committee of the National Federation High School Sports from 2006 until 2008. Linda currently lives in Waban, MA. with her family and is slowly adapting to umpiring in the Arctic Northeast.